IATC LP will be an investment opportunity to capture value by capitalizing on the current economic conditions of low construction costs, low vacancy rates in the small industrial bay market, and urban growth. This highest and best use redevelopment of the former Hub Oil site will assist in the revitalization of International Avenue while protecting human health and the environment. IATC is a mixed use project of 73,800sf on 4.08 acres, which will include: 1) 6 industrial bays of 3000sf with a retail front, office mezzanine, warehouse, and cargo bay door; 2) 25,600sf of office space in two structures; and, 3) 11,200sf of retail space directly adjacent to a major thoroughfare; and, 4) 19,000sf business incubator (a mix of office and technical space). 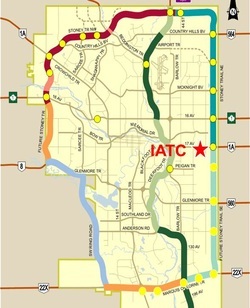 Tenants of the IATC will also receive business development and innovation assistance, linking them in with partners in the Alberta innovation system. The project may contain a specific cleantech business incubator. Impressive Views—Located on a high plateau, the site offers views of the Rocky Mountains and downtown Calgary, especially from the second story offices. Alberta Advantage—Fastest growing economy in Canada. Suburban Growth—Annexation by the City of Calgary of 1 square mile of land from Rockyview, currently committed to land developers and.